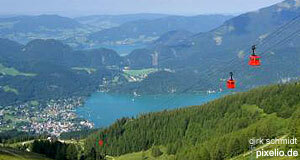 The town of St Gilgen shares an everlasting popularity among domestic tourists with its neighbour St Wolfgang. It is considered to be the quintessential Salzkammergut town with such sights as a town hall, pretty church villas with wooden balconies, the obligatory lakeside promenade and mountainous setting. No wonder it′s packed with tourists every single summer. The town museum "Heimatkundliches Museum" is located in a burgher house from 1655 and makes a good introduction to both St Gilgen and the region of the Wolfgangsee. The mother of Wolfgang Amadeus Mozart was born in St Gilgen, and it wouldn′t be Austria if this occurrence wasn′t pimped out to the tourists: a "Mozart Gedenkstätte" (Mozart Memorial Site) is open to visitors in the county′s court Bezirksgericht. It is rather interesting as a testimonial of 17th and 18th century living in the Salzkammergut rather than for the family-connection with the composer, but worth a look. A share of Mozart for everyone! Mozart′s sister Nannerl happened to end up in St Gilgen at the later part of her life by coincidence (she married a local civil servant), adding some justification for the exhibition. There is also a small museum of ethnic musical instruments ("Musikinstrument Museum der Völker") in the town. Otherwise, the promenade, lakeside and general prettiness is best explored by strolling around in St Gilgen. For more ambitious hiking, you could climb one of the local mountains or take a cable car up the Zwölferhorn Mountain (departs from the bus station). For a less touristy, more tranquil approach to the lake, go to the village of Strobl where you can immerse yourself in swimming and other water sports. Alternatively, you can go for walks or use it as a base for hiking trips in the region. There is also a popular "Sommerrodelbahn" ("summer tobogganing") rail near Strobl - there is only few actual attractions in the village, but if the lake made you go to the area and if you dislike crowds of tourists, Strobl might be the better option for you. The name "Strobl" is derived from an old term for "fluffy man", by the way - according to legend, this is a reference to a wealthy fisherman settling in the region.